The spectacular battle sequences are this movie's only asset, and they're just not going to cut it on any TV smaller than 40". The handful of battle scenes that make up a good hour of "Pearl Harbor" are adrenaline-pumping and hyper-realistic on a massive scale. You feel the impact of every single 7.7mm round from dive-bombing Japanese Zeros as they rip through pavement, planes and people in the infamous attack around which the film in centered. Director Michael Bay's camera goes inside cockpits, rides along on bombs from release to explosion, captures the terror of a torpedo in the water from the deck of a ship and includes some of the best special effects ever put on film. The money shot is a hull-buckling blast that rips through the USS Arizona. It makes being on a luxury liner hit by an iceberg look like a 25-cent carnival ride. But take away this 40-minute sequence and the film's last-act recreation of the retaliatory Dolittle raid in April 1942, and what's left is an uninvolving, 150-percent predictable, totally paint-by-numbers nothing of a movie with a few good performances propping it up from time to time. Producer Jerry Bruckheimer and director Bay (they make brain-dead popcorn flicks like "Armageddon" and "The Rock") never met a trite plot device they didn't like, and "Pearl Harbor" is teeming with them -- right down to that lamest of action movie "aww" moments: the cute dog that survives the disaster and comes bounding happily back into its master's arms. Nevermind that no enlisted man would have been allowed to keep a dog on a Navy ship. From the very beginning Bay starts gearing up his sledgehammer poignancy by pulling heartstrings with all the subtlety of a back-alley dentist pulling teeth. One of our fighter pilot heroes (Josh Hartnett) survived an abusive father and the other (Ben Affleck) is dyslexic, which is a cheap way to make him all the more valiant. "I'm not here to read a manual!" he passionately impugns. "I'm here to be a pilot!" And the orchestra swells as if to say, "Look what they overcame! Aren't they brave and wonderful?" Of course, they're also both endearingly rebellious hot-shot pilots, as demonstrated in an appetite-whetting early stunt-flying scene followed immediately by a sharp reprimand from their commanding officer (Bay has obviously seen Bruckeheimer's "Top Gun"). The film sets up that these two have been best friends since childhood before setting up that Affleck and a pretty nurse (Kate Beckinsale) have recently been struck hard by Cupid's arrow. 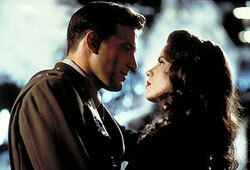 Because Affleck is anxious to prove himself, he volunteers for duty in the British Royal Air Force early in 1941, and after a montage of spectacular dogfights, he's lost at sea and presumed dead. He is not dead, of course, but his best buddy and his true love don't find that out until after crying on each other's shoulders has graduated to doing more intimate things with other body parts. The three leads all scrape together fine performances (Affleck cuts an especially dashing figure in his vintage Army uniform), but they don't have much to work with since their characters are little more than cardboard cut-outs wading through highly-scripted moments of transparent valor. But when December 7, 1941 finally rolls around with the three of them all at Pearl Harbor, the characters set aside the love triangle's complications, the movie drops all its pretense and "Pearl Harbor" becomes, temporarily, an astonishing feat of moviemaking. The flurry of political and military events in the hours leading up to the attack are edited together in pulse-quickening scenes that bring to life the panic and frustration of last-minute intelligence reports, the preparation of the Japanese fleet (handled delicately, skillfully and with honor) and the frightful swarm of Zeros in low-altitude approach over the island of Oahu (if you've seen the trailers, you know how good this scene is). But as good as these scenes are, they're pure showmanship on Bay's part. His microsecond-attention-span editing never pauses on any one shot long enough to give us a good look at the scope of what's happening or its aftermath, and while visually the 40-minute attack is mind-blowing, emotionally it's totally inert. Even when Bay cuts back to the harbor hospital, where Beckinsale is treating the wounded that are arriving in droves, the only lasting impression is a visual one -- the warped window pane-style photography which serves both to illustrate the mass confusion and to keep the blood and guts at PG-13 levels. After the Pearl Harbor attack, Bay has a hard time re-engaging for the movie's third act, as the action shifts to Washington, D.C. where retaliation is the topic of the day and Jon Voight plays President Roosevelt in what is unquestionably the film's best performance. However, this transition leads to the movie's most powerful passage: The bombing raid on Tokyo, lead by Colonel James Dolittle (Alec Baldwin), in which 16 ground-based B-25s managed to take off from a aircraft carrier (two of them piloted by our heroes) to carry out a daring surprise attack before their fuel runs out and they have to ditch their planes in China. If the first 150 minutes of this movie were as good as this last 30 minutes, "Pearl Harbor" might have been both a great war movie and a great action movie. But as impressive as the two immense battle scenes are, they're just not worth suffering through the other two hours of the movie to witness.